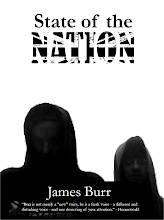 James Burr: New Story published at Bizarro Central. A new flash piece has just been published at Bizarro Central. This was an odd one in that I wrote the first draft of this some 20+ years ago, when I was going through my Baudelairean Poemes en Prose phase (I managed to avoid going through a Lovecraftian phase, unlike many authors. But as I say, I did go through a six month period before I really found my voice where I was turning out little Baudelairean sketches which, while the ideas behind them were very much my own, the approach was very cynical and weary a la Baudelaire, and the prose was almost a pastiche of the great flaneur). I liked the idea but I could never really think of what to do with it until this summer, when I was trying to write a lot of new flash fiction to get the 'ol writing muscles warmed up for a bigger story I wanted to write. I was quite happy with the way it turned out especially as I was really happy with the voice on this one; distinctly my voice (all elements of Baudelaire gone!) and the actual ending was improved, too. Anyway, you can find the story over at Bizarro Central.